Much like Andy Warhol’s shock of white hair or Big Bird’s saffron plumage, the president’s vibrant hue is so consistently present and meticulously maintained that it was a culturally embedded representation of him long before he entered politics. WASHINGTON — The trees in the capital are barren, spindly things. The temperature has dipped, requiring puffy coats. With the government open — for now — President Donald Trump has left the frigidity of governing for a weekend in Palm Beach, Florida. But in a town where not even the longtime operation of the federal government seems certain, Trump has adhered to one constant: a conspicuously sun-kissed glow, one that has shone like a stoplight against Washington’s graying backdrop. Much like Andy Warhol’s shock of white hair or Big Bird’s saffron plumage, the president’s vibrant hue is so consistently present and meticulously maintained that it was a culturally embedded representation of him long before he entered politics. 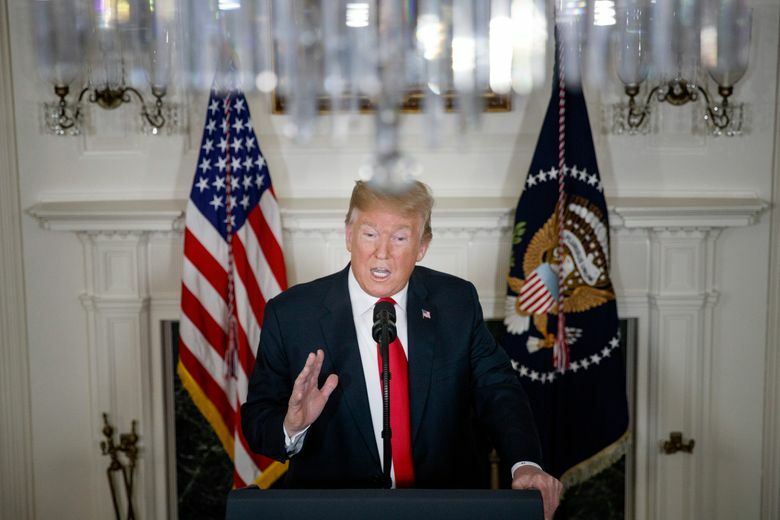 The president’s shade is one that Alec Baldwin, the actor who portrays Trump regularly on “Saturday Night Live,” recently described as vacillating between a “Mark Rothko orange” and a “slightly paler Orange Crush,” depending on the setting. Which right now is February in Washington. “Which is not in the tropics last I checked,” Baldwin said in an interview. The official line from the White House, as with other matters surrounding the president’s physical health and appearance, is that Trump’s glow is the result of “good genes,” according to a senior administration official who would speak only on condition of anonymity. And, OK, a little powder — a translucent one, not a bronzer — which the president applies himself before television appearances, the official said. But according to three people who have spent time in the White House residence, no such bed or spray-tan booth exists in a hidden nook of the residence, a cranny of the East Wing or a closet on Air Force One. Two senior White House officials insisted no such apparatus exists. Several of the president’s supporters had little to say when asked how the president achieves his glow or other ways in which he prepares to get camera-ready. One former campaign hand admitted that aspects of the presidents’s process sound “like a captivating story” but declined to elaborate, saying Trump should be allowed to get dressed in peace. Aside from a tanning bed, another plausible theory is that Trump uses self-tanning creams or lotions. Dr. Tina Alster, a top Washington dermatologist who said she had treated officials in every White House, including this one, posited that the president, whom she does not treat, was using tanning creams or sprays to achieve his look. “He looks more orangy than he does tan,” a telltale sign, Alster said. Another sign — and one that would rule out dietary supplements or medicines that give skin an overall tan, Alster added — is the sight of the often-present white circles under Trump’s eyes when he goes before the public. She added that Trump’s skin appears to show past sun damage, and praised him for breaking any former tanning-bed habits. 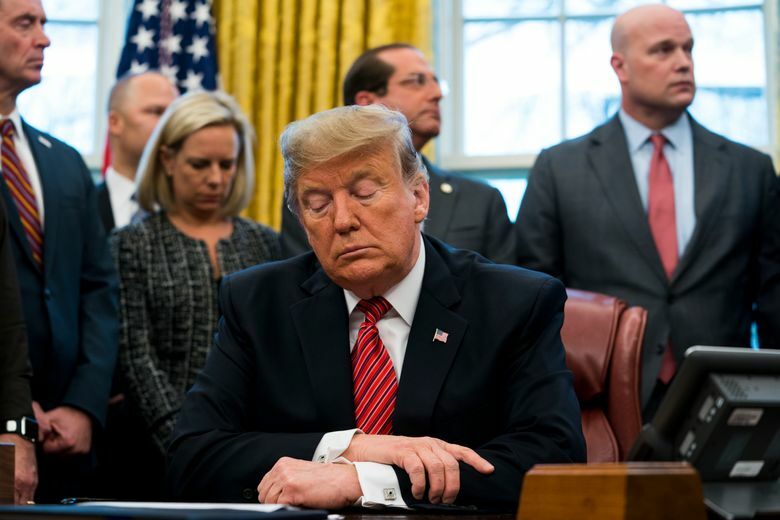 Certainly Trump, who has long taken antibiotics to treat rosacea, a condition that can make the skin appear rosy and ruddy, is attentive to how he looks on television. He has complained that his skin and hair appear too yellow or orange on the screen, according to one person familiar with his views. As a result, events in the White House are now more dimly lit than in previous administrations. The president has also become a fan of natural light, like the setting of the White House Rose Garden, where Trump chose to announce the end of the government shutdown in 40-degree weather. Whatever Trump may do or not do to his skin, he does it in private. A taxpayer-funded White House makeup artist has volunteered her services, but she has not gotten close enough to try, according to two people who have overheard such discussions. A half-dozen current and former aides and people close to Trump say he has long been self-sufficient in matters of grooming. His hair, for example. Trump has repeatedly documented the act of self-styling his coif, a process he has not strayed from in decades. His system includes a Head & Shoulders shampoo and an hourlong air-drying of the strands while he peruses newspapers or watches television. And tweets. In the White House residence, where Trump enjoys giving tours to his supporters, there exists an array of hair sprays on a shelf in his remodeled bathroom. According to several people who have visited the residence, there is not an ounce of a self-tanning product. Or at least it is not in sight. Baldwin, the actor, said that the makeup artists on “Saturday Night Live” are instructed by Lorne Michaels, the show’s executive producer, to stay as close to Trump’s ever-changing shade as possible, and not to over-orange anything out of malice. At one point, the products used to bronze Baldwin included a Clinique powder in a honey-colored hue. But the camera adds a few shades. “It’s a nice coating,” Baldwin said of the end result.